Design details : This plant is potted in a brown Indian ceramic octogonal pot. Flamingo Flower (Anthurium White) : True to its common name of painter’s palette, Anthuriums are now available in almost every color of the palette. Anthuriums perhaps belong to a small group of houseplants that are treasured both for their flowers as well as their rich foliage. Light: Good light is needed, but you must always avoid direct sun. Shaded balconies, patios are the best places. Feeding: A weak all purpose feed once every 2 weeks is necessary for regular flowering. Repotting: Anthuriums grow profusely if well cared for. So you can repot them every year during spring. Propagation: They produce offsets regularly. Remove them while repotting and voila … each grows into a new plant! Flowers: They flower very often and each flower lasts a long long time (upto 30 days). They flower throughout the year! General tips: Anthuriums are good office-goers. In offices, put them near a window and the moderated temperature will work wonders on the flowers! 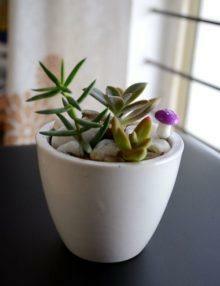 Design detail : This plant is potted in a brown Indian ceramic octogonal pot. Flamingo Flower (Anthurium Purple) : True to its common name of painter’s palette, Anthuriums are now available in almost every color of the palette. Anthuriums perhaps belong to a small group of houseplants that are treasured both for their flowers as well as their rich foliage. Flamingo Flower (Anthurium Orange) : True to its common name of painter’s palette, Anthuriums are now available in almost every color of the palette. Anthuriums perhaps belong to a small group of houseplants that are treasured both for their flowers as well as their rich foliage. Design details : This plant is potted in a mustard Indian ceramic oval pot. Flamingo Flower (Anthurium Pink) : True to its common name of painter’s palette, Anthuriums are now available in almost every color of the palette. Anthuriums perhaps belong to a small group of houseplants that are treasured both for their flowers as well as their rich foliage. Design details : This plant is potted in a black Indian ceramic oval pot. Flamingo Flower (Anthurium Dark Red) : True to its common name of painter’s palette, Anthuriums are now available in almost every color of the palette. Anthuriums perhaps belong to a small group of houseplants that are treasured both for their flowers as well as their rich foliage. Design detail : This plant is potted in a black Indian ceramic rectangular pot. Note: Comes with Garden Elves.